Get this season's style with Faye’s Peter Pan collared dress. With brocade being a big trend, this dress is the perfect piece to add. 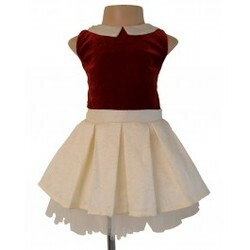 The Peter Pan collar that lays flat on the dress neckline is a cream that brings out the red in the dress and breaks up the pattern and matches the pleated skirt.Best kids wear bangalore store The back of the dress has a sash that ties into a bow to make this dress striking from the front and the back. Ivory net plays peek-a-boo at the hem. So get this season’s pattern with a pop!.This Beautiful kids frocks Available at Faye Store India.